How to get and use money for trips to Paris & France, why your credit card may not work, and what to do about it. The unit of currency in France is the euro, as in most other countries of the European Union. Use your home bank ATM/cash card to withdraw euros from French distributeurs des billets (ATMs/cashpoints) or Retrait (cash witdrawal). Check with your bank to see if this will work without problems. You may also want to check the exchange rate, charges and fees imposed by your bank on foreign currency withdrawals, which may amount to 3% to 6% of your money. 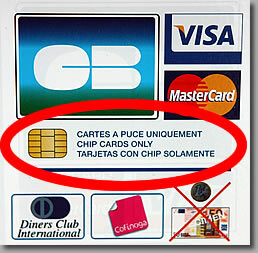 Use a credit card, widely used for purchases in France, but only if it is a credit card with a computer chip in it (carte à puce). If you plan to withdraw cash via your credit card, check the exchange rate, charges and fees imposed by your credit card company on the transaction(s). These may add up to a substantial amount. You may want to apply for a card that imposes fewer fees on foreign withdrawals before you travel. You can exchange your home currency cash (dollars, pounds, yen, yuan, rubles, etc.) for euros at a bureau de change (currency exchange office) in France. Exchange rate spreads, commissions and service fees in France can take as much as 10% to 20% of your money for each exchange, so currency exchange offices may not be the thrifty option, and these days offices are few and far between. Banks do not exchange foreign cash. In fact, many banks handle no cash at all except through ATMs. 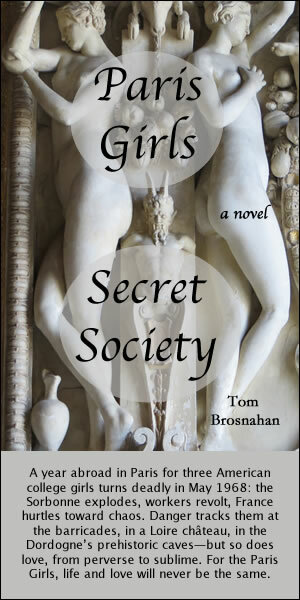 Many people imagine that travel in Paris and France is expensive. It's not true. Some things in France are expensive, some are moderate in price, and others are positively cheap compared to prices in other countries. Here are sample prices to give you a feel for your daily disbursements in Paris. A good tip in Paris or anywhere: whenever you pay with cash, always count your change. 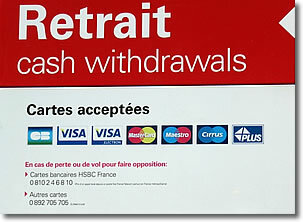 Retrait = Cash withdrawals from an ATM.